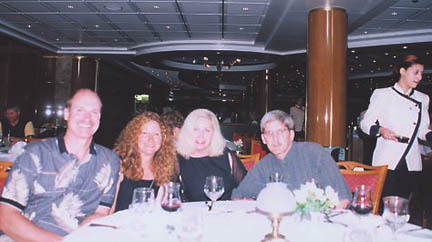 We are back from our cruise in the caribbean, we were gone from March 2nd through March 9th, 2002. 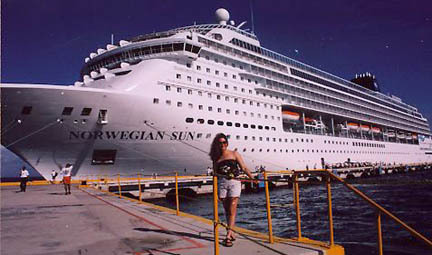 We cruised on the Norwegian Sun. The package we booked was through Cruise Value Center in East Brunswick, New Jersey (800) 231-7447. I will give a day by day breakdown of where we were and what we saw. Since we only had one day per island, we didn't have enough time to get to know them well. We stayed at the Quality Inn by Metro Detroit Airport. They charged $93 which included the one night stay and parking for 8 nights. The Quality Inn is nothing fancy but you get a breakfast bar included in the price. 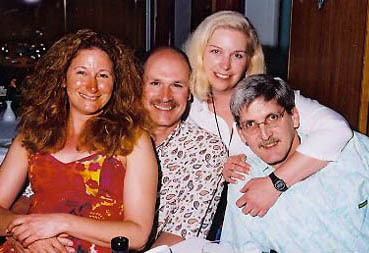 We were vacationing with longtime friends Carl and Deborah. Deborah called us at the hotel to tell us Carl was going to the hospital to get checked out and would show up late to their room or try to meet us at the airport. As we were checking out of our room in the morning, we met Carl and Deborah who had just checked in and it turned out Carl needed to get an operation for a hernia when he returned. I think it might have been the 5 pieces of luggage they packed that caused the hernia. We started our trip by flying from Detroit to Fort Lauderdale. We flew Spirit airlines since it was about $100 cheaper than Northwest into Miami. 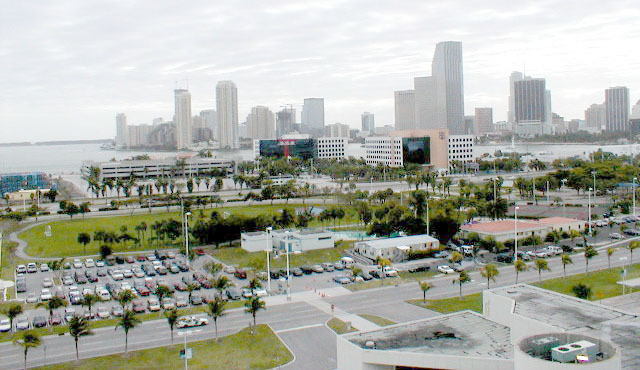 We rented a car from Hertz for $51 for one day and stayed at the Marriott in Fort Lauderdale. 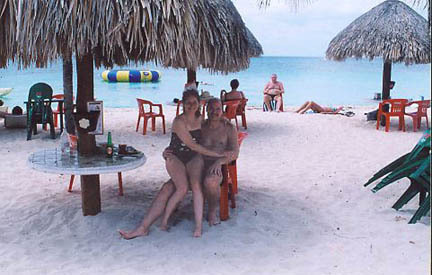 We walked around the beach and ate lunch at the Aruba Beach Bar. They have very large sandwiches and after eating, checked out a few of the shops in the area. Lynn found a couple bathing suits with her name on them and Carl found clipon sunglasses. For dinner we went to the Mai Kai restaurant. We said hi to a couple friends from our complex in Key Largo (Caroline and Steve), and had some good food, drinks and entertainment. It cost the four of us about $180 for drinks, dinner, and the show. After breakfast we drove our rental car to the Miami Airport and caught a shuttle to the Norwegian Sun. The Sun was launched in September of 2001. Norwegian Cruise Line JED latitudes # was 130243124 now 220299291. We boarded about noon and after unpacking went to get lunch and a free drink (a coupon from the traval agent). We then signed up for scuba diving excursions in Roatan, Honduras ($90) and Belize ($120). Of coarse the first day you have the mandatory emergency drill. At night the comedy of Chris Pendleton was at the Stardust Lounge, she was good. 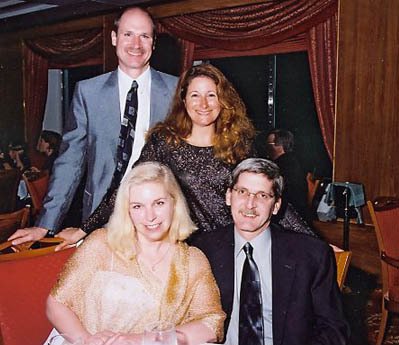 After exploring the ship and reading the literature we went to the Freestyle dining room for dinner. The ship is a 75 ton ship, they say a 100 ton has lounge chairs on the lower levels because the walkways are wider. I liked that because you can have a quiet spot away from the crowd and noice of the band up top. Freestyle dining means you go when you want, and sit with whoever you want. It is nice although you don't build up a relationship with your wait staff, like you do when you have assigned seating, but everyone was nice. It seemed most of our waitstaff were from Romania or the Phillipines. With freestyle dining, they also do freestyle tipping. A charge of $10 per person per day automatically goes on your bill, it is for your room steward and the wait staff, although you can change it if you want. Dinner can be a little busy if you go later (7:30 or after) because a lot of people are eating before or after going to the show. The food in the Four Seasons (Deck 5, Midship) had almost the same choices as the Seven Seas, (Deck 5, Aft). These restaurants and the food in the Garden Cafe were included in the cruise. The food in the other restaurants (IL Adagio, Le Bistro, Ginza, East Meets West, Pacific Heights) were extra charges. I don't know how much because the food in the Four Seasons was good, with enough choices to keep us happy. I think I had prime rib the first night. Well, what do you do on a sea day. We slept in, ate, exercised, laid out, ate, explored, and dressed for the Captain's Welcome Party. The Captain's Party is more formal dress. It started with champagne and appetizers and then off to dinner. I think I had lobster tail. We went to bed early, just to relaxed. Encore! Mr. Producer was at the show. The Cayman Islands is a British Crown Colonys, 480 miles south east of Miami and 150 miles south of Cuba. The highest point is a mere forty feet above sea level. 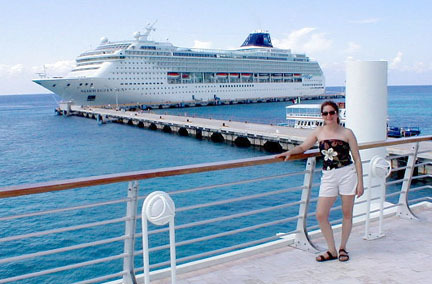 Grand Cayman is the largest and most populous of the trio, occupying 76 square miles of the total 100 square miles of land mass. 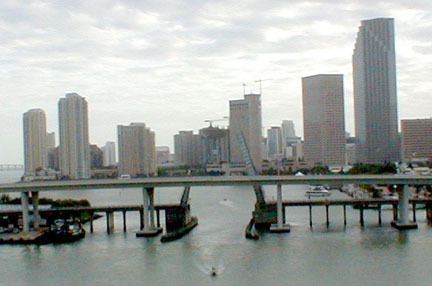 The climate is very desirable with average temperatures between 72 and 86 degrees fahrenheit during the day. Little rainfall and cooling trade winds ensure that the Cayman Islands enjoy a perpetual summer. Just off the coastline is crystal clear water with visibility reaching the depths of 150 ft., encompassed by the Cayman Trench, the second deepest point in the Caribbean at 22,000 ft. The exchange rate is not good, the dollar is worth only 80 cents. 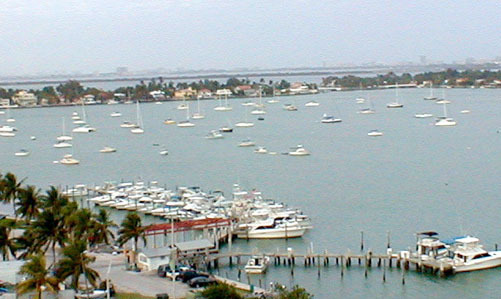 Columbus discovered the Caymans in 1503. 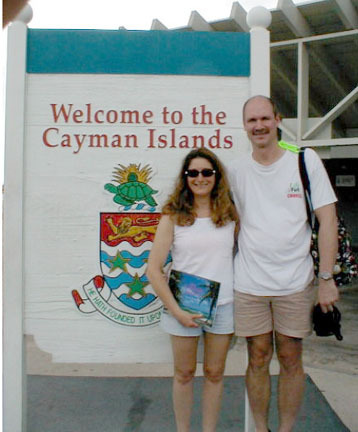 The Caymans have one of the highest financial global GDPs. As a British colony, Grand Cayman is administered by a governor appointed by the reigning British Monarch, Queen Elizabeth II. Driving is on the left side of the road. Past vacations we stayed a week each on Grand Cayman and Cayman Brac, and dove during our stays, so we decided to skip the diving here. Carl and Deborah said the snorkeling excursion was good. We arrived at 8:00 and took a tender to shore. We looked at a few shops downtown and then went to see a customer/friend that Lynn and I made back in 1988. Barbara and Ed picked us up at the Book Nook II and took us on a tour of their other store and the island. The day flew by and after lunch we had to say goodbye and got back on the tender at 2:00. The last tender left at 2:30. After dinner and more food than I should eat, we went to see Jane L. Powell in Concert. It was a good show and the band was also very good. Lynn bought a couple CDs to bring home. Roatan Bay Islands is the largest and most developed of the Bay Islands, a cluster of islands 3 miles north of Honduras in the Caribbean Sea. The island's coral reef makes it a popular tourist and diver destination. 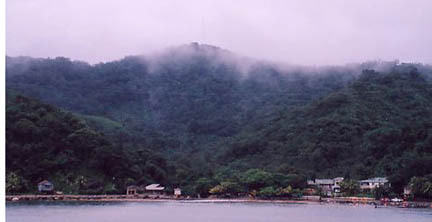 The island of Roatan is 53 km long and 5 km wide. It is located 65 km off the northern coast of Honduras in the Caribbean Sea. Its 127 square km make Roatan the largest of the 68 islands and cays which make up the Bay Islands. Roatan features beautiful beaches, a lush tropical environment, and magnificent coral reefs. Scuba diving is the main attraction, but snorkeling is also great. We woke up to the ship rocking and wondering if we would be able to go scuba diving. The boat arrived at Roatan at 11:00. After breakfast we went to the Dive In desk to find out if we were going to be able to dive. Due to the bad weather the dive boats were unable to get out of the North port so we had to wait until the afternoon and boats that were in the South port could take us out. Snorkeling was cancelled altogether. We were able to go to shore for a few hours and look around, then meet to get a bus ride to the boats. Town was nothing fancy but there was some interesting shops. The dive was ok, not a lot of fish, but nice coral, sponges, and plant life. The North side is suppose to be the good side for diving, so we were disappointed but glad we were at least able to dive one dive. The excursion cost $50 instead of $90 due to the fact we only got one dive and the dive operation didn't even charge us for renting the fins, and bcs. We brought our own mask and regulators. I wore a t-shirt with 10 lbs. and Lynn wore her danskin with 8 lbs. It started pouring rain as we went out and made it a little chilly. The water felt warmer than the air. P.S. When I came home and went to give blood at the red cross, I was told I would not be able to give blood for one year because Roatan, Honduras and Belize were on their list for malaria risk. Belize is peaceful, democratic and primarily English speaking, it seems in many ways not to belong in Central America at all. It is more a Caribbean nation rather than a Latin one, looking out from the coast rather than inland for its trade and alliances. Spanish runs a close second as a spoken language. Over half the tourist are from North America, but a growing number come from Europe, mostly from Britian. 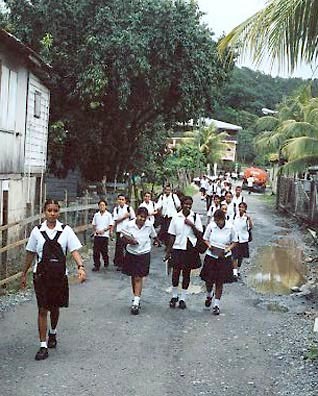 Belize has the lowest population density in Central America. Its land area is balanced by an almost equivalent amount of territorial waters, giving visitors plenty of scope to explore little-visited islands as well as the heartland of the ancient Maya culture. We arrived in Belize at 8:00 am and got on a dive boat to go diving. The dive excursion took 7.5 hours of the 8 hours we were in Belize, so we did not get to go downtown. The waters are shallow, so the boat had to anchor out a ways, it took 45 min. by tender to get to Belize and we took 1 3/4 hours to get to the dive site, Turneffe Atoll. The largest of Belizes's 3 coral atolls, lies 22 miles from Belize City outside the barrier reef. The dive operation was very good, I believe their name was Aqua Dives. The air temperature was 74 and the water temperature was 79 degrees. I dove with my shorty and 14 lbs. of weight. It was a drift dive and on the first dive we saw a scorpion fish, large spotted eagle ray, spotted eel, puffers, etc. It was a good dive, about 70 ft. for about 40 min. We then had lunch at a research center and headed out for another dive. It was also very good. We saw another spotted eagle ray, a stingray, turtle, queen angles, etc. After dinner, Carl, Deborah, and I went to see the Magic and Illusion of World Champion Magician Maverick. He was very good, especially with his hands and card tricks, but it seemed like the same old thing to me. Lynn was exhausted by either the full day or the bonine and headed to bed early. I think she was just trying to get to the mints on the pillows before me. In 1961 Jaques Cousteau proclained the waters around Cozumel as some of the best in the world, Cozumel was transformed from a quiet sleepy village into a world famous dive center of excellence. We decided not to dive here because we did on a past vacation. The diving is very good. 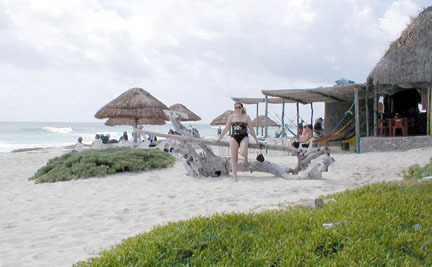 Previously, we stayed at the Galapagos Inn, now called Scuba Club Cozumel. This was the only island we docked at and we were here from 8:00 am until 7:30 pm. Just 12 miles from the eastern coast of the Yucatan Peninsula, the island of Cozumel is approximately 29 miles long and 9 miles wide. Powdery white sands, crystal-clear waters, protected environment for snorkeling or scuba diving. Carl and Deborah did the snorkeling trip from the boat and were disappointed, not seeing a lot of fish. We rented a car for the day ($31) and drove to the Paradise Beach Bar on the south side of the island, it was deserted and peaceful. 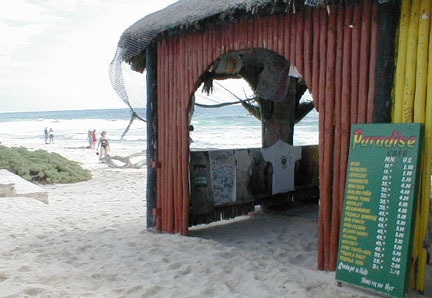 We then tried a beach called Sanches halfway back to downtown, which had showers, baths, pool, shade and a restaurant. After picking up Carl and Deborah and exploring the same two beaches we continued around the island, checked out a few shops, bought 1 liter of Baileys Irish Creme ($18) and Kahlua especial ($13) then back to the boat. We ate late this night and missed the show. Another hard day of sleeping in, eating, sunning, eating, eating and watching Lynn and Deborah try to choose what photos to buy on the ship. The last day you need to pack your bags, leave them outside the door before 3 am. The Farewell Variety Show was with comedian Chris Pendleton and singer Jane L. Powell, it was a good show. We were back by 6:00 am, disembarked by 9:00, took the bus to Hertz, rented a mini-van ($51) and drove to Key Largo to drop off our regulators at the condo and have lunch at the Mandalay. It made the last day fun. Then back to Ft. Lauderdale to catch our plane. We were in Detroit by 10:30 but didn't get out of the airport until 11:30 due to bad weather and few pickups by the park2fly lot. The roads were terrible and it took us until 1:00am to get home.